Did somebody say bacon?? That reminds me of the commercial where the dog runs around saying, “bacon, bacon, bacon”. 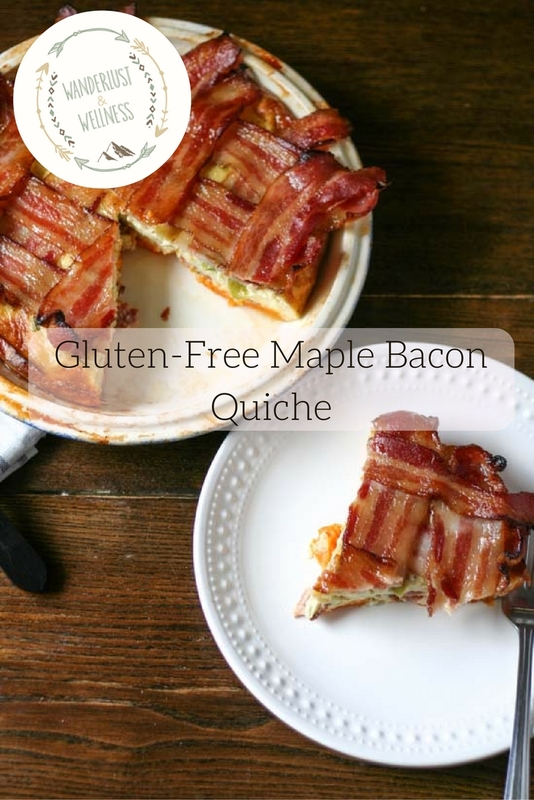 I’m a sucker for bacon and an even bigger sucker for maple bacon. There is just something about that combination that makes it oh so good! I am also a sucker for a good quiche. I started to make this quiche with a gluten-free pie crust but decided to go an even healthier route and use my sweet potato quiche crust. Sweet potatoes are becoming my new favorite quiche crust! 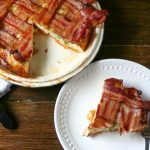 For my strict Paleo eaters, there is cheese in this quiche but you can totally leave it out without drastically effecting the overall taste. Look at those layers! Sweet potatoes, topped with savory egg, bacon, cheese and onion, then topped with maple coated bacon. 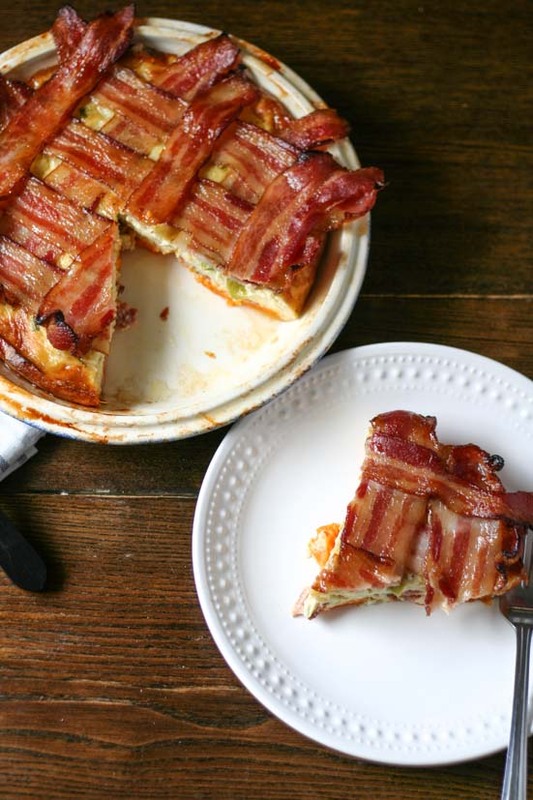 I mean really, you CANNOT go wrong with this quiche. This is the perfect brunch recipe you can stun your family with. Peel your sweet potato and slice into thin rounds. You don’t want them too thin, about a 1/4 in. thick. Grease a 9 in. pie plate with coconut oil. Arrange the sweet potato rounds in the dish to form the crust, overlapping when needed. Brush coconut oil onto the sweet potato crust, sprinkle with Himalayan salt. 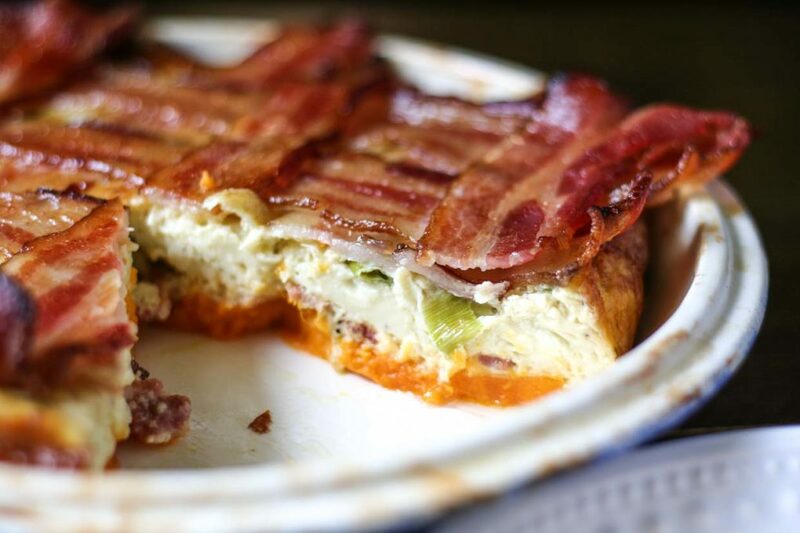 While the sweet potato crust is baking, cook 3 of the bacon slices, crumble and set aside. In a large bowl, whisk the eggs. Then add in the milk, salt, pepper, cheese, green onion, and crumbled bacon. Whisk again to combine. Once the crust is finished roasting, remove from the oven. Decrease oven temperature to 350 degrees F.
Pour the egg mixture into the pie plate and bake for 35 minutes. 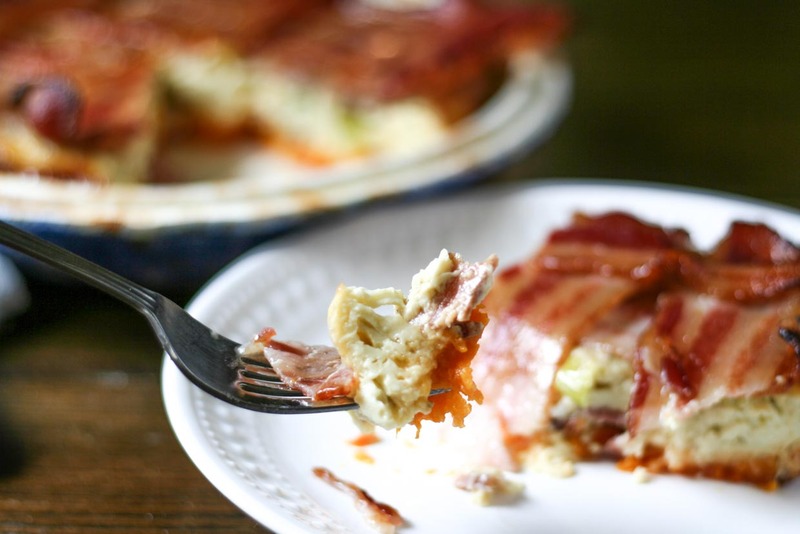 Remove from oven (quiche top should be firm), weave additional 8 slices of bacon (uncooked) onto the top of the quiche. Then brush the bacon with maple syrup. Place the pie plate onto a baking sheet (to catch spillover) and bake for 15-20 minutes until bacon is done. Carefully remove baking sheet from oven, tip and drain off any extra bacon grease, and let sit for a few minutes before serving.